Published: Sept. 11, 2016 at 04:16 p.m. 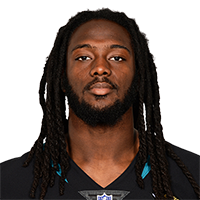 Published: Sept. 11, 2016 at 03:11 p.m.
Jacksonville Jaguars quarterback Blake Bortles finds wide reciver Allen Hurns for 37-yard gain. Published: Sept. 11, 2016 at 02:32 p.m. Published: Sept. 11, 2016 at 01:43 p.m.
Jaguars T.J. Yeldon breaks through tackle for 5-yard touchdown.